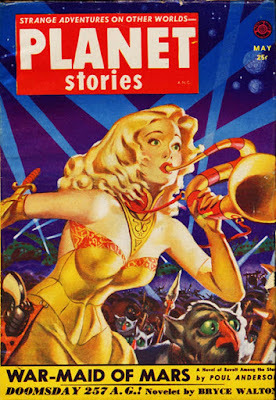 Another excellent Allen Anderson cover on this issue of PLANET STORIES. Why the War-Maid of Mars' raygun looks like an old-fashioned Western six-shooter at first glance, I don't know, but it's eye-catching, as are other, ah, attributes. Maybe Anderson adapted this from an unused painting he did for LARIAT STORY. Anyway, speaking of the War-Maid, I wouldn't mind reading that story by Poul Anderson. I'll have to check and see if it's ever been reprinted anywhere. The only other familiar names in the Table of Contents are Bryce Walton, Robert Moore Williams, and J.T. McIntosh. I looked for that issue on the Internet Archive and didn't find it. I'll have to do some more digging. 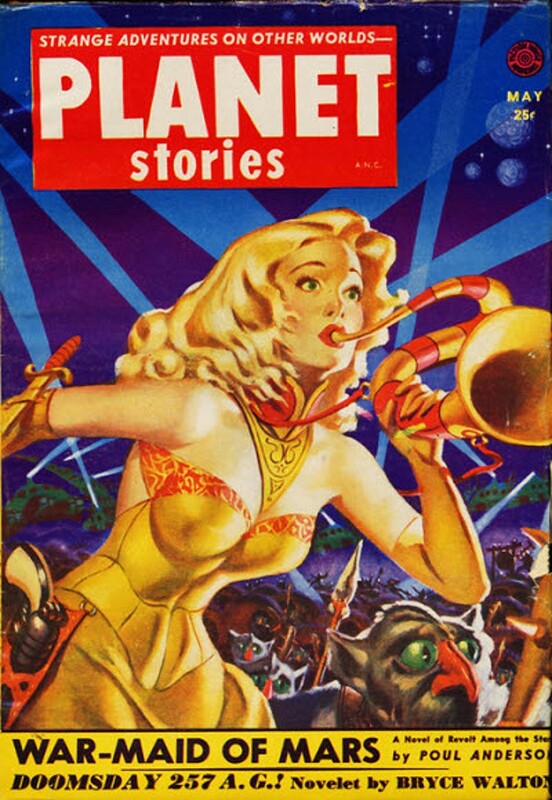 My friend Morgan Holmes has been saying for years that there needs to be a big collection of all of Anderson's stories from PLANET STORIES, and I agree. Oops, should have mentioned — that glorious Anderson cover isn’t the thumbnail for some reason. Search for “Planet Stories 1952 05” — and then click on the “Save Your Hair” back cover ad. This site has had problems with dropbox since before Christmas, but I expect them to figure something out eventually. Luckily I d/l every Planet Stories they had before they went down. Their regular pulps are still there though, and it's there I go every time you post another cover to see if it's a magazine I can download. This cover is being used to advertise this year's Windy City Pulp convention which is scheduled for April 12 through 14, 2019. Thanks, guys. I now have this issue called up on my computer to read when I get the chance.